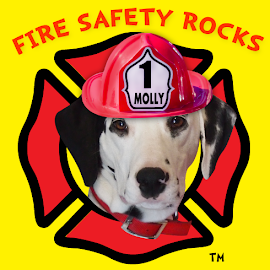 Fire Safety Rocks: Big adventure! It's me Sparkles! I am so dog-gone thrilled to share some really exciting news! 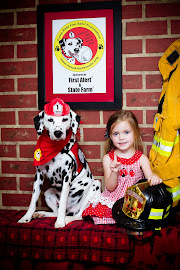 As many of you may know, Frankie's mom and my mom (Firefighter Dayna) met on Facebook. Next thing I know, I have a brand new friend! In February, Frankie and I got to meet for the very first time when I helped my mom do a presentation for the boys and girls at Clarksville Primary. What was extra fun about that day was that I got to meet Frankie on Skype! Frankie and I made history that day and it was a day that I will cherish in my heart forever! I could tell how excited my mom Firefighter Dayna was, and Frankie's mom was excited too! That day is all that they ever talk about! I live in Arkansas and Frankie lives in Wisconsin. Tango, mom and me will be em "barking" on a big adventure and will be traveling to Wisconsin next week, and we will meet in person (ok, that should really be dog, don't you think?) Not only will we meet for the first time, but we have some special things planned. 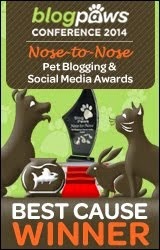 Wednesday, April 7th: Mom, Tango and I roll into Elkhart Lake, Wisconsin for the official sniff and greet! 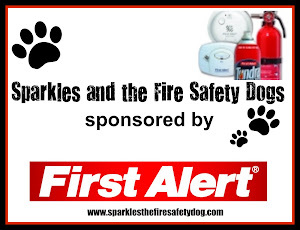 Thursday, April 8th: Sparkles' and Frankie, along with Mom's Dayna and Barbara head over to Elkhart Lake Fire Station for day of photo shoots and video coverage. This documentation will be put together into a future e-book! 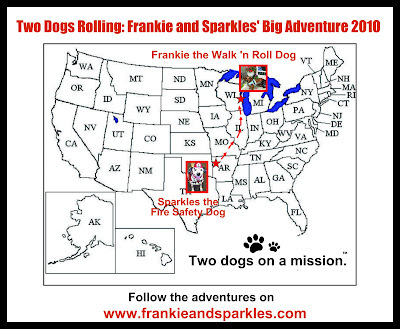 Friday, April 9th: Sparkles' and Frankie roll on over to Elkhart Lake/Glenbeulah Elementary School to do a first time ever, special presentation for K-5 boys and girls. 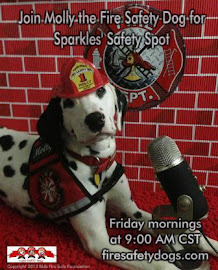 Sparkles' and Frankie will then do a Skype presentation from Frankie's home in Elkhart Lake and chat live with students in elementary school in Western Canada. Karen Keys, teacher/librarian is thrilled for this opportunity for her students! 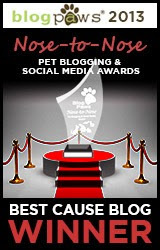 So do keep checking back as we share the unfolding of our big adventure, Two Dogs Rollin'! To view the media release, click HERE.